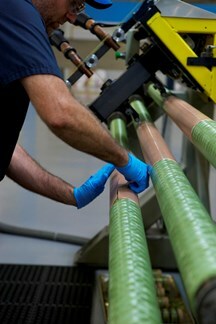 In the late 1980’s, the world of composites saw a steady increase in the use of pre-preg filaments in manufacturing. However, there was a problem. At the time, the filament winding machines were simply not able to handle the unique characteristics of this new material. With this problem to solve, a small Utah company named Composite Solutions set out to fix this and create a new filament winding machine. 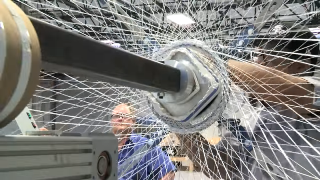 They soon succeeded at this by developing a state-of-the-art 4-axis filament-winding machine that could properly tension, wind and control the pre-preg filament. The development of this machine, and the success that came with it, became the foundation for the Composite Solutions company. Though they started as a small business venture in the 1990s, Composite Solutions soon grew to a multi-million dollar company as they expanded into additional services such as filament winding, bladder molding, flat panel fabrication, autoclave curing, thermoplastic and thermoset compression molding and matched mold processing of composite materials. They manufactured components for the aerospace, defense, marine, oil, commercial and recreational industries in their modest 16,500 sq. ft. shop. 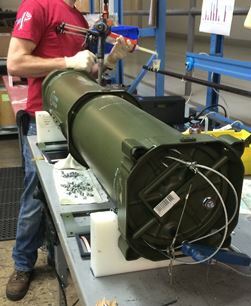 In 2009, Composite Solutions caught the attention of the Nammo Talley company in Arizona which represents the Shoulder Fired Systems division of their parent company, the Nammo Group headquartered in Raufoss, Norway. That year, Nammo Talley acquired Composite Solutions, and changed the name from Composite Solutions to Nammo Composite Solutions (Nammo CS). As part of the Nammo Group conglomerate, Nammo CS received a significant amount of resources to propel their business into a new phase of growth. With new capabilities, staff, and revenue base Nammo CS moved into a new 67,000 sq. ft. state-of-the art facility in 2011. Strong growth continued and just two years later they expanded that facility to 90,000 sq. ft. in 2013. “Moving to our new plant in 2011 gave us the breathing room that we needed, and just 2 years later, here we are again”, said Brian Lundy, Nammo CS President at that time. “Our core composite business continues to grow at a fast pace and our customers are relying more on Nammo CS than ever before for not only manufacturing but for assembly, vendor management, and problem solving”. Today, Composite Soltions/NAMMO CS has been operating for over 25 years and is still going strong. Their staff of over 150 includes engineers, designers, managers, composite technicians and skilled machinists. 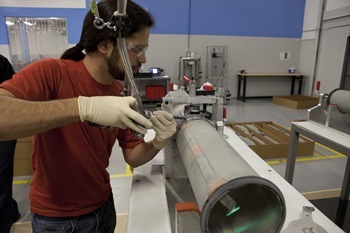 Their facility operates under a robust QA system compliant to NADCAP and AS9100 Rev C requirements and runs a three-shift operation year round. Nammo CS excells in providing design and manufacturing “solutions” for technically challenging composite products. High-Temp, thick wall, low CTE, tight tolerance, odd shapes, and cored composite structures are a few examples of “difficulty” niches they service. With a broad range of composites manufacturing and machine shop capabilities to draw from, Nammo CS designs efficient process, or combination of processes, to manufacture these challenging composite structures. They have extensive in house processing expertise in filament winding, braiding, resin transfer molding (RTM), bladder molding, autoclave/oven/press curing, metal and composite tooling fabrication, and extensive machining equipment and capabilities. They take a “M&P Neutral” stance to design, under their belief that the best material and processes will “trade out”. Although they primarily serve the defense industry, Nammo CS has diversified into other industries such as marine, oil, commercial, and recreational. Within these industries they strongly believe in a “partnership” mentality and seek to serve the customer. Because of this, most of their customers have been with them for over a decade. When asked what sets them apart, Nammo CS defined their four main strengths as: First, their ability to engineer composite structures with a broad understanding of design, stress analysis, available materials, tolerances in concert with manufacturing processes to find the optimum approach; Second, effective management of tooling and product development into full production; Thirds, state of the art application of filament winding. They now have six machines with their latest being a 3 spindle, 4 axis machine. They are also just one of a handful of companies to do tri-axial braiding throughout the world ; Fourth, long term customer relationship approach. With every project they seek to provide open communication, technical support, professional workmanship and deliver on time. Following these core strengths, Nammo CS expects solid growth over the coming years. In just the last year, they have gone from 80 to 150 employees. Sustaining this rapid growth is the biggest challenge for them right now, but it’s a challenge they feel they can handle. Employees at Nammo CS say that whenever things get hard there, they pull together as a team and find success. “It’s one of the defining characteristics of who we are,” they said. With this type of attitude and work ethic, the future looks bright for Nammo Composite Solutions.